The engagement ring options available to today’s couples are nearly infinite. Our bespoke engagement rings possess beauty and level of craftsmanship which can’t be compared. White gold is the first choice when it comes to bridal rings, though rose and yellow gold can be fascinating choice for modern rings. There are so many gemstone rings available which are perfect for the purpose and can be worn for years. Sapphire is the most durable gemstone and it comes in a rainbow of colors. 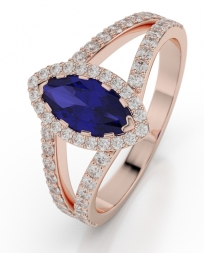 Royal blue sapphire, worn by Princess Diana and now Kate Middleton, has already become the favorite of modern brides. This classic gemstone in rose gold is the perfect one for your better half. 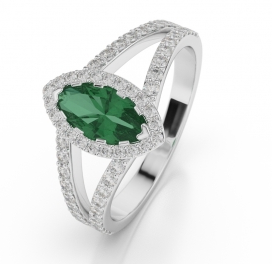 One of the most popular and eye-catching gemstones, Emerald is the gem of royalty, romance and intrigue. Unlike diamonds, the clarity of emeralds is evaluated by naked eyes. Emerald with no inclusion is considered as a flawless one. Its durability and popularity makes it a perfect choice for engagement rings. Ruby is one of the most valuables varieties of gemstones. This gemstone is well known to evoke passion. 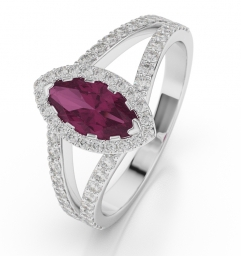 Durable, rare and symbol of everlasting love; pick rose gold ruby and diamond engagement ring to make style statement. One of the newest and most exotically colored gemstones, Tanzanite is named after the East African state of Tanzania. Woman who wears this exclusive gem is someone who loves to stand out amongst the rest. The exclusivity of this gem makes it so much popular gemstone. 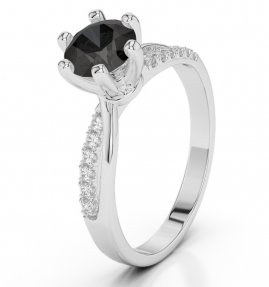 Black diamonds are considered as “fashionable jewellery” to wear for special occasions. According to some people, black diamonds are as old as our solar system. Black diamonds are the rarest among all diamonds. Costume jewellery is the best and easiest way to find whatever jewellery you want.In here some wonderful designable engagement ring. Those are no nice for engagement party. Keep it up.